Sri Lanka is to develop the Palali airstrip in Jaffna as an international airport, mainly to cater to Indian traffic. An official from the Ministry of Civil Aviation, said that they would seek Indian assistance for this venture. “The development of the North is also of high priority in the government’s agenda and an international airport in the peninsula would boost its regional economy in a big way.” When fully operational, the Palali airport would also cater to the growing Indian traffic. The government is also expected to lure courier service airlines to the new Mattala Rajapaksa International Airport in Hambantota. “DHL, UPS and Fedex, are top on our agenda, so that they could launch African operations from here,” he said. Both flyDubai and Air Arabia, would operate two direct flights from Mattala to Sharjah and to Dubai. Two frequencies from SriLankan Airlines, Beijing, Riyadh and Male schedules would also be operated from the new airport, while religious flights operated from Mihin to Buddha Gaya, would take off from Mattala. 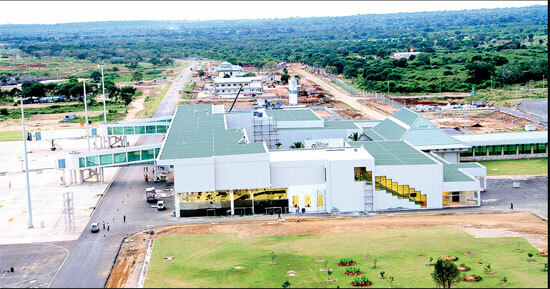 Mattala Rajapaksa International Airport would be declared open on March 18. It would serve as the second hub for SriLankan Airlines and Mihin Lanka.SriLankan Airlines would also set up a MRO facility with the assistance of Germany’s leading logistic company Lufthansa in Mattala Rajapaksa International Airport. Emirates, has confirmed it will send a high profile delegation to the opening of the Mahinda Rajapaksa International Airport, Mattala, Sri Lanka’s second international airport on March 18, 2013. Adel Al Redha, Emirates Executive Vice President of Engineering and Operations and Adnan Kazim, Divisional Senior Vice President, Planning and Research will represent the airline at the event and will use the occasion to meet with the country’s aviation sector policymakers. The visit to Sri Lanka for the airport opening by two of Emirates’ most senior officials reflects the continuing commitment of the airline to the country’s aviation sector. For over 25 years Emirates has played a key role in supporting the development of Sri Lanka’s tourism industry and economy with passenger and cargo services. Colombo was the fourth destination on the Emirates network when services were launched in April 1986.